Ralph of Diceto (d. 1202) gained an education in Paris, and became a dean of St. Paul's Cathedral in 1180. He wrote a variety of historical works. This page has material relating to the powers of rulers and churchmen. The column in the centre lists the episcopal sees of England, while the one to the right discusses the Roman emperors. 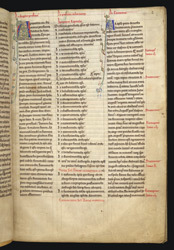 In the list of bishops, a later scribe has added notations in red for the martyrdom of Thomas Becket. Sources for the discussion of emperors (Eutropius and Suetonius) are cited in the margin.